We have been working with National Museum Wales for a number of years, from working on their communications to the interior of their restaurant in National Museum Wales Cardiff. 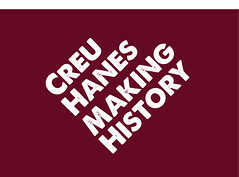 More recently we have been developing a brand with them for their Creu Hanes - Creating History project. At the moment, St Fagans concentrates on the history of the people of Wales over the last 500 years. They will bring the national archaeology collections from National Museum Cardiff to St Fagans, to help them tell the story of the first people to live in Wales 250,000 years ago and to place the story of Wales in the context of world history. David Anderson (Director General) has outlined his radical overhaul for the museum, which will see the National Museum’s archaeological collection brought to the site. The move will take St Fagans from a museum looking at Wales’ history from the Middle Ages to one looking back to the days of the first human habitation in Wales. This is part of a 10-year investment that will present a strong message of change and exciting new directions. It will reinforce the position of St Fagans as a must-see attraction for visitors to Wales - an essential element of Welsh heritage tourism that will benefit the whole of Wales.